I have recently acquired to more TFL-760Ht. 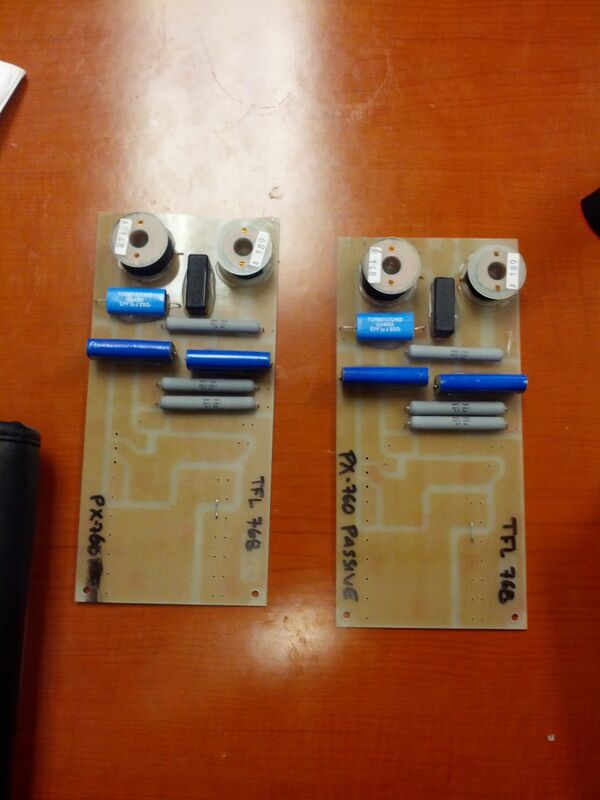 The problem is that theese have been modded with a homemade filter to make them a 2-way box. I need to make them identical to the boxes a already have and make them 3-way again. 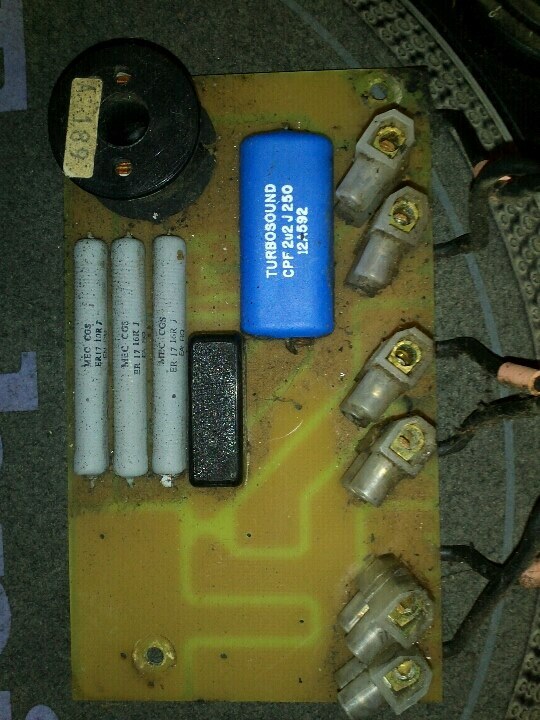 The seller is going trough his storage looking for the original HF protection filters, but not shure he can find them. Pete from Crystalpro can't help me since Turbosund no longer supplies theese. -Can anybody explain what exactly the PX-760 does? Read somewhere that it makes the 8 ohm CD-103 into 16ohm? -Can i reverse engineer it and make my own? -Can i mod the PX-760/X and use it as a protection filter only? 1)-Can anybody explain what exactly the PX-760 does? 2)Read somewhere that it makes the 8 ohm CD-103 into 16ohm? 3)-Can i reverse engineer it and make my own? 4)-Can i mod the PX-760/X and use it as a protection filter only? 1) The PX-760 HF protection filter appears to be a 12 dB per octave filter (the acoustic response could be higher order) with attenuation and a thermistor cut out which functions like a circuit breaker, opening when too much average power is exceeded. The filter probably shapes frequency response also. It seems redundant (other than the thermistor) for use with proper DSP, but these were made for use with fixed analog crossovers which had no EQ compensation, and make the HF more "bullet proof" if someone accidentally sends mid or low mid to the HF. 2) It could make the overall HF impedance more like 16 ohm than 8. 3) Yes, just copy all the components and circuit. Other than the thermistor they all seem to be labeled. 4) From the appearance, the PX-760/P Internal passive filter for optional passive HF is the same as the PX-760 HF protection filter with an additional coil and capacitor to roll off the 6.5" high mid range driver at 8 kHz. You could use the top portion of the crossover for the HF driver and wire the high mid directly to pin 3 HMF-, pin4 HMF+, but you would be paying for extra unused components and circuitry. I feel a little stupid now. Just as you said i could just use the HF portion of the filter. I might as well order them now.